One of my favorite versions of burgers to order out is something usually called a Blackened Bleu / Blue Cheese Burger. I decided awhile ago to learn to make these at home, and here’s what I came up with. Since Old Bay Seasoning in burgers was always a hit with me, I like to use Old Bay with Blackened Seasoning for the Blackened Bleu. 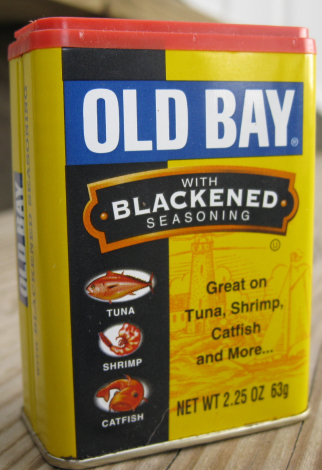 There are others out there, like Chef Paul Prudhomme’s, and Zatarain’s Blackened Seasoning, as well as dozens of homemade versions (which I vow to try someday), but for now, the Old Bay version works great for me. In a bowl, combine ground beef with the Worcestershire and Soy sauces, garlic powder, pepper and salt. Make some nice patties about a 1/2 inch bigger than your rolls, press your thumb in the center to make a dent. 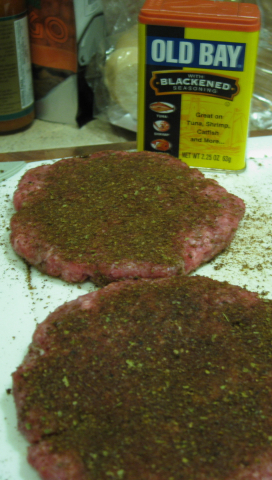 Then sprinkle a generous amount of the blackened seasoning on both sides of the patties. Pat the blackened seasoning in good. Grill the burgers as you normally would – preferably over direct heat turning once. Then either on the grill for the last few minutes or on the plate while the patties are still hot, sprinkle some crumbled blue cheese on them. I like alot of blue cheese, but be warned, it is naturally salty and very strong. Put these babies on some toasted kaiser rolls with only lettuce and a slice of tomato, and you’re good to go. No need for other condiments. (I did cheat and dip my burger in some new Lea & Perrin’s Thick Worcestershire Sauce) or you can add anything you like to the salty, spicy, blackened burger you desire! We served these burgers with Baked Beans and a side of Wickles Pickles. Yum! If you’ve made these, or love the blue cheese burger please leave a Comment below. I’d like to know how you make them. Because of a recent comment on this older post, I decided to feature it on the front page again! ~enjoy! I know what I am having for dinner tonight! I haven’t heard of some of the seasonings you used, but I think I’ll give them a shot. I just found your site, but if you have recipes like this, I’ll be spending a lot of time reading through. @Ben -Thanks for the nice comment and for stopping by. It really is an easy recipe, and you can even kick it up with some bacon if you like. Let me know if you make this burger. This looks delicious. Blue cheese is way underused in recipes, IMO. I’ve gotta try this sometime. Sounds really tasty, I’m gonna have to try those! It’s gonna be a blackened weekend. I think I’ll make one of these blackened bad boys with a slice of habanero cheddar. These burgers are excellent! I have tried various blue cheeseburger recipes, and I think this one tops them all. I make them on onion rolls, with grilled onions and blue cheese as the only toppings! Hey Jeremy, I love the idea of the onion roll! Thanks! Also, I just love it when someone finds one of our older posts and comments on it. Some blogs can and do turn off Comments on a post after a given time, but when it comes to spicy food and sauces… they are timeless! I can’t wait to try this burger. I love any meat blackened or spicy even with hot sauce and hot peppers. Signed up for HOTSAUCEDAILEY NEWS. Ah, a woman after my own heart! I love blackened foods too. Thanks for signing up for the HSD News too!